All kinds of health issues are nothing but a pain and inconvenience for those who suffer from them. Because of this, when injuries and other health issues arise, getting specialized treatment from health and rehabilitation experts, like us at Pioneer Trace Healthcare & Rehabilitation, as soon as possible will be beneficial for your comfort and convenience. And with the helpful tips provided below, a quick recovery from health conditions should be achievable. Take full rest. After getting discharged from the hospital, you will be given a set of medications that you need to take in order to get completely well. These drugs may make you feel tired and dizzy, forcing you to get more sleep.Thus, the many hours of sleep that you take will give more time for your body to respond to the medications and recover from your health condition. Adhere to your Doctor’s advice. There’s a reason why you turn to your trusted doctors when you suffer from a health condition. They know more about health than you do. Therefore, listening to their advice and religiously following their prescriptions will be very beneficial to your health. Get post-hospitalization care. Getting discharged from the hospital doesn’t mean that you are completely free from the illness you suffered. Sometimes, doctors will discharge you if your condition is not severe enough to warrant more days in the hospital. In order to have a full recovery, it would greatly help to hire skilled nursing services to give you the expert post-hospitalization care that you need without having to stay or pay more for being inside the hospital. Regularly clean wounds and change dressings. Making sure that your wound is clean and well taken care of is necessary in order to prevent infections or slower recovery. Just keep in mind to sanitize the wound area and the new dressing is clean before you replace the old one. If you are hesitant to change your dressings on your own, you can always hire the help of a skilled nurse to make sure that everything goes smoothly. Do not let the wound area get soaked. When you need to clean up yourself, take a quick shower instead of a bath so the wound can dry up quicker. Also, avoid putting pressure on the wound area as much as possible. Watch for any signs of infection. Even if you think you’re cleaning and taking care of your wound properly, you still have to keep monitoring the progress and condition of your wound. If you have noticed any weird appearance around the wound area or if it’s taking more time to heal than expected, you might need the help of a skilled professional to inspect it. Get a skilled care. There is no better way to avoid infections and properly care for wounds than hiring the services of a skilled nurse. Pioneer Trace Healthcare & Rehabilitation has a team of skilled and well-trained nurses to make sure that you are getting proper wound care and more. To improve your mobility, exercise regularly. Performing regular physical activities, such as stretching or walking, can help enhance your balance, coordination, strength, endurance and more. With all these things, as time goes by, you will be able to move around better and easier. Avoid putting pressure on your injury. If you are nursing an injury, however, make sure to get enough rest and do not forcibly move the injured part. Get some help from a professional. Be sure to have a physical therapist or a skilled nurse from a trusted provider of Rehabilitation Services in Flemingsburg, Kentucky to check your injury or mobility so you will be given a proper advice on how to recover quickly and fully. Like they say, health is wealth and, therefore, should be handled with excellent care. 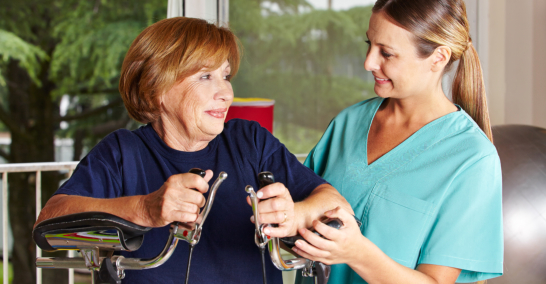 To recover your most precious possession timely, getting the most outstanding and effective Rehabilitation Services in Flemingsburg, Kentucky from us at Pioneer Trace Healthcare & Rehabilitation will make healing so much faster and efficient for you. Schedule an appointment today by calling us at 606-845-2131. This entry was posted in Rehabilitation and tagged Living normally, Recovery, Rehabilitation. Bookmark the permalink.